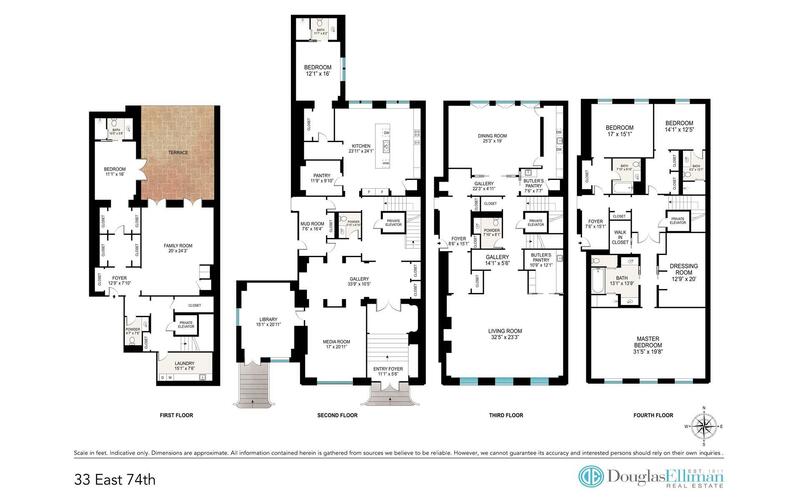 Designed by famed architect, Grosvenor Atterbury in 1901, this 33' wide townhouse features the privacy and exclusivity of a single family home while offering all the conveniences of a full service condominium. The interior design palate of neutral grays and creams has been beautifully executed and is effortlessly classic. From the breathtaking entrance foyer finished in Chambord Limestone & polished plaster, to the 5" wide white-oak planked floors throughout, the townhouse exudes sophistication. The massive chefs kitchen has Olympian White Danby Fleuri Stone countertops, and Olympian White Danby vein cut marble island and low luster white lacquer cabinetry. The kitchen has been outfitted with all top of the line appliances, such as Wolf range and oven, Sub-Zero refrigerator, freezer, and wine-cooler, Miele dishwasher, and Dornbrocht faucets. The townhouse features approximately 10,088 sq ft over four floors with both a private and public passenger elevator servicing each floor. There are currently 5 bedrooms and 5 full baths and 3 half baths. The parlor floor features over 12' ceilings with beautiful south facing floor to ceiling arched windows and there is a large private terrace off the first floor. There is no other townhouse/condominium in the city that can compare!